Please Sign in or Register, It's Free . Thank You so very much for this wonderful gift set! thanks like it very much !! Thank you for this set - so cute! This is so cute!! Thank you very much!!! Just so cute for Halloween. Great for Grandkids. Thank you so much for this surprise. Y'alll are great! Thank you so much! A very nice surprise! That is so cute and so generous. Thank You. Thank you for the cute font. Thank you & Happy Anniversary!! Very cute spider. Thanks... this is a cute alphabet. how generous- thank you so much- and just in time for spooky embroidering! I never thought about a spider being cute...but here I am and there it is. Thank you for this alpabet! I am petrified of real spiders but these guys are awesome. Thank you so much and a BIG HAPPY BIRTHDAY! WoW ! Thankyou. Happy 5th birthday ! Feliz cumpleaños, gracias por el regalo, muchas bendiciones,que se te devuelva en salud y prosperidad, para ti y tu familia. Happy Birthday beautiful alphabet thank you very much! Thank you, the spiders are too cute!! Thank you so much, and happy birthday! Thank you! My grandson is obsessed with spiders and this is perfect! Thank you very much. Happy Happy Birthday!!!! Thank you sew very much and Happy Birthday. You're unique because, we get a gift from you on your Birthday. Thank you so much for the cute spider alphabet. Happy Birthday to Cute. Thank you, really cute I know how I will use thes already. You made me happy.A very nic gift. Thank you for the cute font! This is so cute. Perfect for all the little ones on my list for Halloween. These are the cutest little bugs. Thank you this is a really cute set, just in time for next month. Thank you for the Birthday Fonts and Happy Birthday! Happy Birthday! Thank you so much for the lovelly gift. happy birthday!Thank you for the cutie spiders. Happy Birthday! Thank you for the gift! Thank you for the cute gift. thankyou for the georgeous spider designs I will treasure them always. You have the most beautiful designs on this sit and you look after your customers very special and we appreciate it so if anyone reads my comment try cute alphabets they are amazing. Happy 5th birthday and thank you soooooo much!!! Thanks, u'r so generous. Hugs. Thankyou for the Birthday gift!! Thank you so much !!!!! What a generous gift. Hi, Happy birthday, this is also a birthday for me at work 1st employee that has 5 years service. So I will be celebrating with you. Thanks for all the free designs over the years, that is the first thing I do in the morning. Maria from sunny Pretoria, South Africa. Hartelijk Dank voor het spinnenalfabet! OH My Goodness... What a nice surprise! Thank you so much for your generosity! Yhankyou so much for this great alpha. Your continued generosity is greatly appreciated. Thank you so much for this gift. You are a very generous person. Thank you so much!! They're adorable!! Thanks! They are so cute. Oh thank you!! This is a fun and silly font. It is perfect for Halloween and lots of kid things. Thank you and Happy Birthday!!! Thank You and congrats on 5 years!! thank you so very much. happy 5th birthday. love the font !! Happy Birthday!!! Thank you for the gift. What a nice surprise. Thank you. They are so cute. Thank you! Perfect timing for Halloween! They are so cute. Thank you so much! Thank You soooo much. VERY NICE!!! That was soo KIND THANK YOU sooooo much!! Thank you so much for the alphabet! Thank You for such a Cute Alphabet! That was a NICE Surprise. Happy Birthday CUTE! Thank you very much!! Very cute for Halloween. Thank you!!! These are soooo cute! Thank you, this will be useful on my Halloween crafts. thank you for the really cute spider alpahabet and all the free designs you generously give! Thanks for the spider font! It's Cute's 5th Birthday and we get a gift! Happy Birthday to you Cute Embroidery!!!! We love you!!!! Thanks so much for another adorable font! Thanks for so generously sharing this font. Happy Birthday!! Thank you for the gift!! LOVE LOVE IT! thank you so much! Thank you for the adorable spider font. I just love it!!! muchísimas gracias por este simpático alfabeto y un muy "Felíz Cumpleaños"
Thank you and Happy Birthday!!! Happy Birthday to You!!! Thank you for the gift. These are just tooooo cute!!!!! Thank you very much. And Happy Birthday!!! Thank you ! This is cute! And Happy Birthday! thank you these are adorable! This is so wonderful. Thank you!!! Thank you so much, it's lovely. My grandkids are going to love this font. THANK YOU, THANK YOU, THANK YOU. Happy, happy birthday and happy happy customers! Thanks so much for the spiderfont. Would love to see some fall designs. Thank you Veronika. Love it. How fun, thanks so much. I love it! Thank You!!! !Happy 5th Birthday! Thank You so much. I love it and what a great time to receive this just before Halloween. Again Thank You. THANK YOU VERY MUCH. HAPPY BIRTHDAY. Five years! Congratulations!!! Thank you for the adorable Spider Alpha, a delightful surprise. Happy 5th Birthday and many more. Thank you for all the freebies you give. Thank You sooo very much for this font and may the next 5 years be as good as the last 5 and even beter for you all Congrats!!!!! Thank You for this really cute alpha. It will be great for boys. Thank you so much and have a Happy 5th Birthday today. Thank you for the wonderful spider font. Happy 5th Birthday and many many happy ones to come and to share with us. Love your designs, thank you very much. Tanti auguri a te, tanti auguri a te, tanti auguri a Cute Alphabets, tanti auguri a teeeee! Thank you very much. HAPPY BIRTHDAY CUTE. Thank you for the alpha gift I love it. Thank you so much for this cute and complete alpha. Congratulations for the 5th anniversary for this site. Thank you so much. This is a great Halloween font and I will certainly use it alot for shirts for all my little friends. Siete stati gentilissimi a regalarci tutto l'alfabeto. Parabéns pelos 5 anos e continuação de bom trabalho. Thank you so much for this very nice alpha and a Happy Birthday for the site. Thank you & Happy 5th Birthday. ThankYou & HappyBirthday!! A Great Site!! Thank you for celebrating your 5th birthday with us and for all that you do, give and share. Best wishes for the next 5 years. Thank you and Happy 5th Birthday! Beautiful designs and great digitizing! Thank you for the set; it will come in handy in October. Tausend Dank für das tolle Alphabet und alles gute zu Eurem 5. Geburtstag!! WOW WHAT AN AWESOME GIFT. TYTYTY. ALL THE BEST FOR THE FUTURE.TYTYTY. HAPPY BIRTHDAY. Thanks for such a cute alphabet. This will be great for Halloween! My grandson will love this. Thank you. Happy 5th Birthday Cute and Family. Thank you for the cute Alpha. I hate spiders but these are so cute. A thank you from me too! I really appreciate your time and talent! Very kind of you. Thanks so much. Thanks so much for the cute gift. Just in time for the Halloween projects, and the kids will love it! You are awesome!! Thank you love this font. thank you so much for this lovely gift. Thank you very much for this lovely gift. Thank you for sharing this spider font! Thank you, what a nice Tuesday surprise! Thank you so much for a lovely gift. Thank you very much. This is exciting!!! Very haloween sscary!!LOL. Thank you so very much for this adorable font!! Happy Anniversary and many more! Thank you so much - just in time for Halloween designs! Happy Anniversary and many more. Thankyou, happy anniversary, many more anniversaries for you. How kind, thank you very much! So cute! Thank you and Happy Anniversary! Vielen dank für das wunderschöne geschenk. Thank you so much!! !and happy birthday! Thank you and Congratulations on your 5th Birthday. Keep up the good work. Thank you so much for the cute font, just in time for Halloween. Thank you so much for this beautiful alphabet. Really appreciate this!! Thank you for the spider font and happy birthday! Such a cute alphabet. Love it. Thank you for the wonderful gift and Happy 5th birthday. Wow! Thank you for the darling set. Thank you so much for your generosity..this is great for Halloween, really cute. What a great gift to have just before Halloween! Thank you so very much for sharing this Halloween Spider Font!! My Great Grandkids will really love this Spider Font. It's a very nice kids Spider Font for our family. Happy 5th Birthday Cute Embroidery! Thanks for the gift on your 5th Birthday. Wow! It's your birthday and we get the presents! Thanks so much! I love this cute bug and my grandson will be delighted. Thanks. Thank you for really cute Alphabet. Just in time for hallowee'en-TU:)!Happy Birthday 2U! Happy Birthday and Thanks sew much for the cute Alpha. wow, thank you! !my grandson will love this. And congratulations with the 5th birthday!! 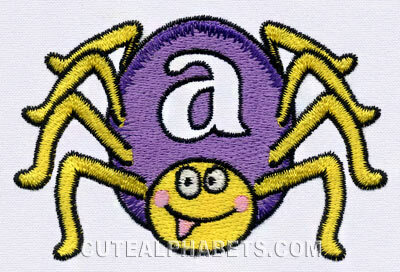 Thank you for the cute spiders alphabet ! Happy Birthday!! THANK YOU. LOVE THE FONT! Thank you for your special alphabet. Very cute. Very cute.....will use on a Halloween design. Thank You and Happy Birthday too! Thank you very much,and Happy Birthday. Happy Birthday - great fonts all around!! Thank you for the cute spiders! and Happy 5th Birthday!! Love the alphabet. Thank you very much and happy anniversary! Thank you very much! Perfect for Halloween! Thank you for the anniversary gift! Thank you, I think its so cute! thanks for this funny alfa! Happy birthday Cute Alphabets! May you go from strength to strength. Thank you very much for the lovely gift. Thank you so much for the gift of spiderfont. Happy Birthday and many more. Your site is a fun site to be a part of. Thank you very much. This is very generous of you. Thank you so very much for this adorable alphabet! Thank you SO much! I love everything you create!So very nice of you to share your talents with all of us. Thank-you so much for this adorable Halloween font! Happy Birthday and Thank You for the gift and for all you do during the year for all of us. Thankyou very much for this very generous gift. Thank you so much for the wonderful gift! Happy 5th Birthday Gute Embroidery ! What a lovely surprise. It is just too cute !!! Thanks so much. yes, merci beaucoup, thank you very much !!! Very Cute! Thank you so much!! Thankyou so much!!! I'm sure my grandsons will love this font and I like that it's in lower case for the little ones. Thank you! Very cute, and very generous.